Have you been putting off a major house maintenance just because hammering is too tiring for you? Then you’ll need a nailer. This NuMax SFR2190 will drive nails faster thus finishing your project faster compared to when you use a traditional hammer. There is a certain type of nailer you might want to check out for your home projects. Framing nailers are the best type of nail gun for general work around the house. A good framing nailer has an amazing accuracy, drives nails into various hardwood surfaces, and can drive around 10 nails in the time you hammer a nail in. Safety features are also necessary to be considered as the best nailer. The user should also know safety precautions to prevent themselves or others from getting injured. The first step to getting the tough home improvement project rolling is to get yourself a nail gun. NuMax SFR2190 highly versatile and is suitable for a number of applications. This includes roof decking, wall framing, sub-floors, and wood fencing. Holding the nailer with one arm and firing with the other is possible since the tool is lightweight at only 8.5 pounds. Using it for sequential nailing is also likely. The unit comes with dual trigger modes let you choose whether sequential or single firing as per your job needs. It works with plastic collated 21-degree round head nails between two inches and three and a half inches. 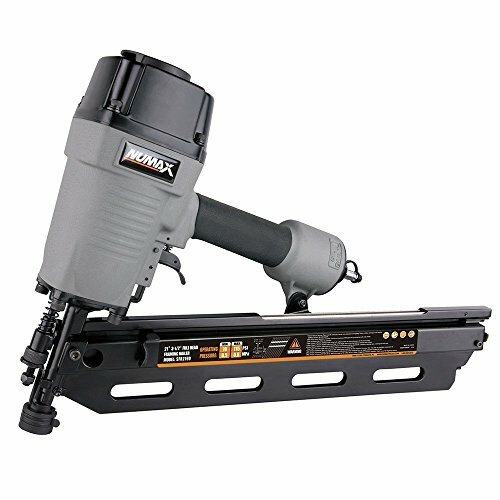 Numax’s framing nailer has a state of the art die-cast magnesium body that offers remarkable durability and dependability you will only expect from the premium units.It also has a screw that allows excellent control or a lock nut if needed which also makes switching from three and quarter nails to two-inch nails easy. NuMax SFR2190 comes with an anti-dry fire mechanism that protects the gun from empty fires and a removable no-mar tip. It also protects pre-finished surfaces from damage. In addition, it also features a black oxide aluminum magazine that ensures that the unit can withstand repetitive jobs. Like any other framing nailer, the NuMax SFR2190 also has a few shortcomings. Some people found its weight to be a challenge when handling big projects, While other found the anti-dry fire mechanism blocking the use of the last three nails as a waste. It is also a challenge to use this framing nailer since it does not work well on wet wood. Read the reviews of people who had bought/used (and are still using!) this framing nailer. They have something to say that might convince you of being one of them. “Bought this to install a backyard fence and then later finish my basement. I had zero issues with this nailer and it worked every time. I paired it with a Portal Cable compressor that I also purchased on Amazon and everything worked great. It makes the job so much easier. “After using about 200 nails, this Framing nailer really does the job. I like the easy loading and the depth adjustment is done without a wrench. It is really powerful drives the 3-inch nails I bought with absolutely no strain. The loading of the nails was really easy and from the top of the magazine makes it faster loading when you doing your work. I would suggest to all purchasers that they take a few minutes to read the well-written manual. I was able to gain a lot of insight on use by doing so. Safety is another concern. Read the manual before firing the nailer up. After reading all the reviews and the seller providing more information, I decided on the NuMax. I think I made the right decision. “I bought this to use for a shed I was building. I was hesitant to buy it because I hadn’t heard of the brand before but the price was right. So far, I’ve run a 1,000 nails through it and it hasn’t had a misfire or gotten jammed. For a weekend DIYer, this is well worth the money. It comes with a trigger to use for bump firing but I haven’t used it. That seems too dangerous and is best left to professionals. “I purchased this to help speed up building a deck and based on the price figured it would be worth trying. It’s worked as expected and speeded the work tremendously. For people wondering if it will work with their compressor – here is what I’ve been using with good results: A small 3 Gallon tank compressor with 3 SCFM rating at 90 PSI. I can drive about 8 nails with it set on 100PSI before the compressor comes on. I can continue to use the nail gun for a few more nails, but if it’s in very rapid succession I need to pause for a few seconds to let the pressure build back up. This rate is faster than I can nail, so it works well with small compressors. The NuMax SFR2190 nailer is a highly resourceful tool worth having in the house. The unit is also affordable proving you with the best value for a DIY enthusiast. While it’s a nailer with a few cons, it delivers quality and consistent results. Don’t hesitate to buy this nailer. It is a worth it tool to have around.